Click the “Settings” tab on the top menu, and from there you’ll find “Record Settings” on the right. By default, the settings are set to automatic. This means that all your settings are optimized based on your hardware. However, if you want to customize your settings, select Custom. 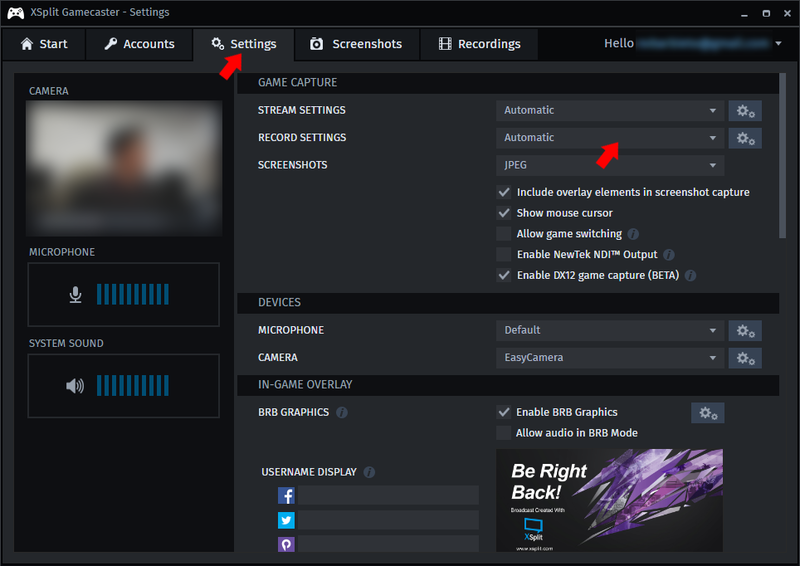 Resolution - This allows you to set the resolution you record your gameplay at. The higher the resolution you pick, the more upload bandwidth and CPU usage is required. Codec - The available codecs will be dependent on your PC’s hardware. x264 is the recommended codec, provided that your CPU can handle it. Framerate - Choose between 30 and 60 FPS. Higher FPS uses more resources. Quality - Choose among Standard, High, Very High, and Ultra High. The higher the quality, the better your recording will look but the file size will also be bigger. Split - You can split your recording files by either time or size. For more information on the specifics of these settings, check this video out. 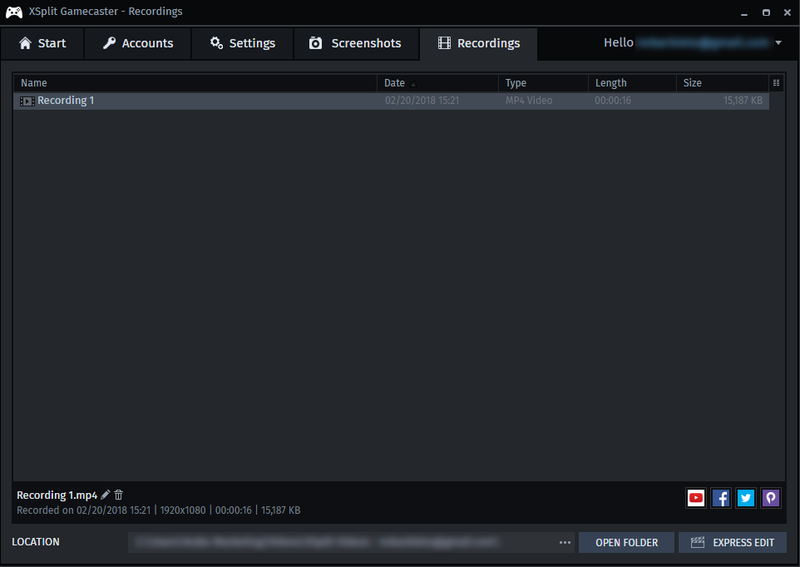 To begin your recording, fire up your game and then press CTRL+Tab to bring up your XSplit Gamecaster overlay. Click on Record to start recording. You’ll see a small notification on the upper left side of your screen to let you know you’re recording. In there, you’ll find all your clips, and see details like date recorded, the format, the video length, and the file size. From there, you’ll be able to rename or delete your clips or share them directly on YouTube, Facebook, Twitter or Player.me. For the resolution and framerate, those settings can be adjusted from the upper right hand corner of XSplit Broadcaster. 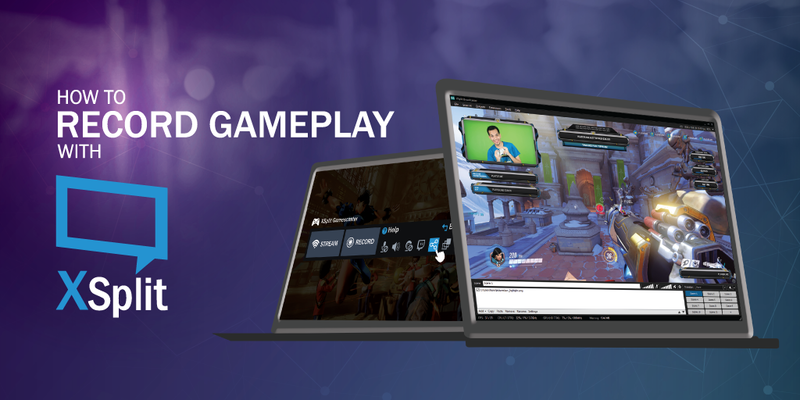 With XSplit Broadcaster, you can fully customize your resolutions and framerates. Again, you have to keep in mind that the larger the resolution and the higher the framerate, the larger your file size will become. From there, you’ll be able to change the video codec, the quality of video, the audio bitrate, the audio format, the output file type, and file splitting. For more information, check out this video. Alternatively, if your game doesn’t run on OpenGL or DirectX 9 - 12, you can select Screen Capture instead. For more details on this, check out this page. To begin your recording, go to “Outputs” from the top menu and click on Local Recording. To stop recording, click on that again. That will open a window where you’ll be able to delete, rename, or upload your file. And there you go! That’s how you record your gameplay via XSplit Gamecaster and XSplit Broadcaster. Simple, right? Now, go out there and play some games.